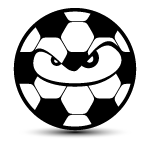 SoccerPro contacted Sideline Soccer to review some of their numerous products! 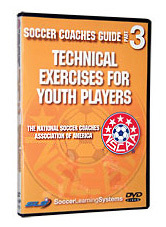 We decided to start with some soccer training DVDs, specifically a soccer technical exercise DVD for youth players by the National Soccer Coaches Association of America (NSCAA). This DVD is meant to help coaches train players between the ages of 13-15 covering Dribbling, Passing, Receiving, Heading, and Shooting. The running time of the DVD is approximately 80 minutes. Each section begins with a warmup and then uses a progression of activities with the coach providing key points to both the players and you the coach. This DVD is a great buy for coaches looking to develop technical skills and learn tactical concepts. Coaches can learn from numerous warmups, activities, field layouts, coaching instructions and corrections, and an emphasis on positive feedback and encouragement to players. If you have bought this DVD, please let us know what you think by leaving your comments below!